Location: The Brashlyan Complex is located in a pine-tree forest, yet within the city limits. Here you can enjoy the silence and fresh air, as well as the unique view to the town and mountains. - 12 one-family houses situated closely to the hotel; the houses offer the following kinds of furnishings: double bed, single bed, folding armchair, cable TV, bathroom with a shower. 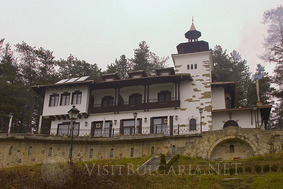 Hotel Facilities: The restaurant is a cozy Tryavna house, offering traditional Bulgarian atmosphere and modern comfort. The interior is completed by a cosy fire place. The restaurant can seat 80 people inddors and the panoramic terrace with the barbecue can seat upto 100 people. At guests' disposal is a conference Hall – 30 seats, a night bar with 40 seats and a parking lot. There is also a recreation centre with sauna and a massage room.